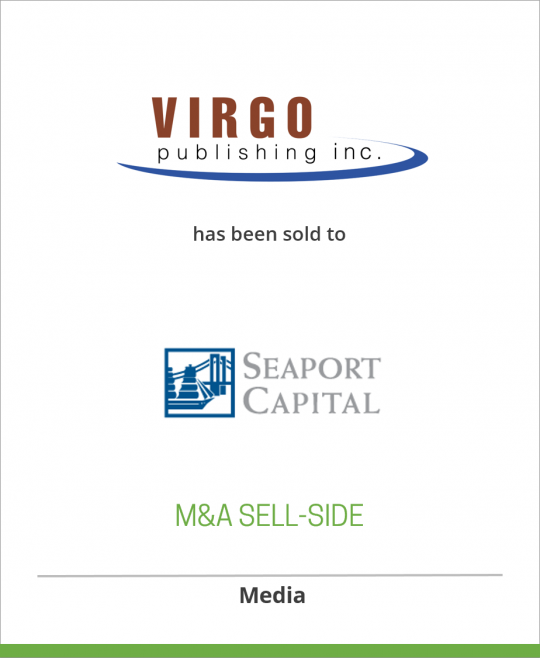 Virgo Publishing, Inc., with sixteen magazines and seven trade shows and events in a diverse range of industries, has been sold to Seaport Capital. Virgo Publishing, Inc., founded in 1986 and based in Phoenix, Arizona, is a business-to-business publisher dedicated to meeting the information needs of niche business sectors. Virgo publishes 16 national trade magazines – many of which are number one in their category – and 7 trade shows and events across several industry groups including natural products/healthcare, telecommunications, light industrial and lifestyle. Seaport Capital invests in middle market media, communications, and information and business services companies, providing equity capital for growth, recapitalizations and buyout opportunities in these industry segments for companies with market capitalizations under $200 million. Seaport Capital is based in New York City and successfully invests in companies headquartered across America – in cities, small towns, and rural areas.